I didn’t see the same weight loss this month, but I have started adding in more cheat days and going to the gym 3x times means that I have bumped up my calorie intake some. More me this month is a big win, my lifting is up about 20% from when I started. My body shape is getting closer to where I want to be, next stop that big V chest! July 8, 2017 by Matt Husby1 Comment on Under 200! 94 days and 39 pounds ago I started down a road to get myself back into shape. I am headed into the gym for the first time in about a year today (Thanks Wayne!) so my weight loss will slow down, but my shape should continue to improve. 30 days into Keto, down 18 lbs! 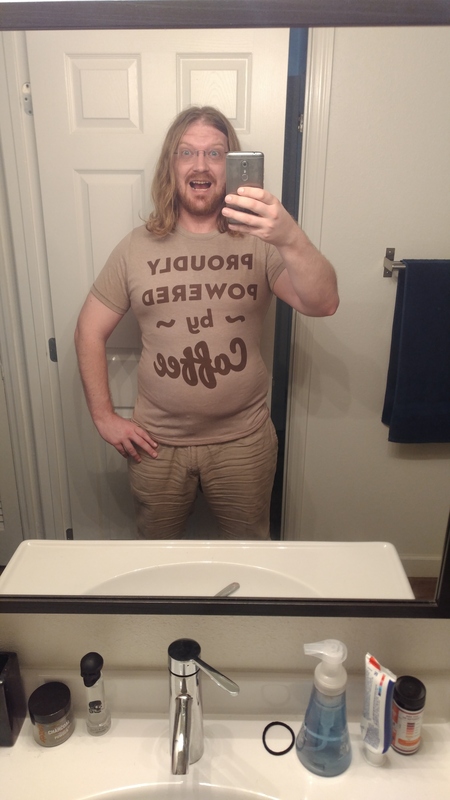 I ordered a skinny shirt a few weeks ago, I l will use this for my progress pics. Doesn’t fit yet, but getting closer.